If you’re looking for some spectacular — and free — ideas for holiday themed knitting projects, look no further than the DROPS Christmas Workshop. This pattern collection includes a whopping eight pages of designs, everything from Christmas tree ornaments to holiday-themed socks, shawls suitable for gift giving, Santa beards and beyond. 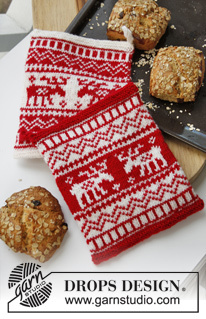 I absolutely love these Christmas pot holders with a moose design on them, because who would think to take the time to work a fancy stranded knitting pattern on a pot holder? But wouldn’t it make you smile every time you used it? This circular yoke jumper is pretty adorable, too. See anything you like? I’d love to hear about it.